It has been a while since I’d checked up on things at the school garden and things were in need of a bit of attention. The pity of school gardening here is that at the peak of the growing season the schools break for summer holidays. In order to get the most out of a plot, the ideal is to choose to grow varieties that are quick to grow so that there is something to pick before the holidays; grow things that can be stored mid to longterm, or choose things that will grow slowly and can be harvested later in the season. I can’t say that I’ve got the balance entirely right yet. So for now all I can do is harvest some produce and store it until the school reopens. Bed A: I thin out some beetroot, harvesting the biggest to make some room in the bed for the carrots. There’s a lovely smell of chives but no sign yet of flowers. Despite sowing them earlier this year to give them more of a chance of flowering, this doesn’t seem to have made much of a difference. If I were to grow from seed again, I’d sow them under cover first, before the last frost, in order to give them a head start before transplanting them into their final position. At the end of this season, I’ll take these plants out of the bed and overwinter them at home, before transplanting them as small plants next spring, and hopefully that will also help. The pea plants have got very heavy, weighed down by the sheer volume of bushy leaf growth and pods full of peas. They are leaning a bit to one side and the sweet peas next to them are struggling to find their way to the wigwam. It all looks a bit of a mess. But all is forgiven when I pick off a pea pod and taste the peas inside. They are wonderfully sweet, it’s all I can do to resist popping them all in my mouth instead of into a plastic bag to take home and freeze….! 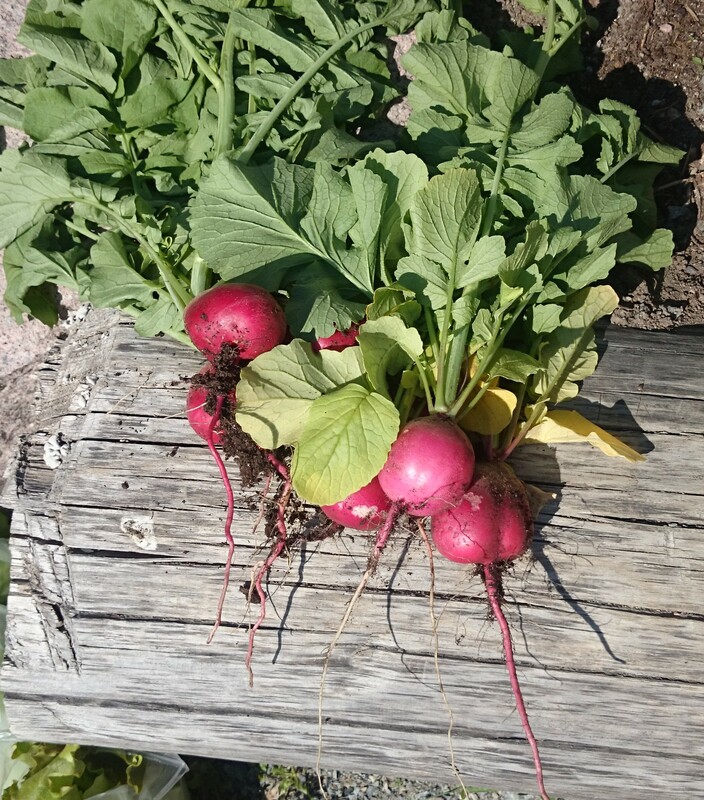 Amongst the dense foliage, I discover some radishes. Unfortunately it seems the school forgot to harvest them before the end of term and now they have become ginormous monster radishes! They have started to degrade inside so they’re no longer good to eat and only destined for the compost heap! 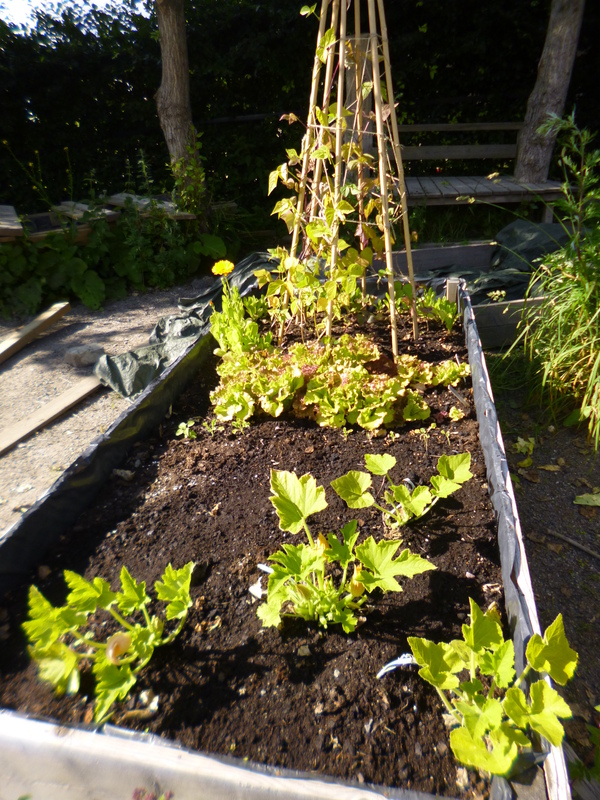 The lettuces in this bed seem to be the only things ravaged by snails/slugs so I leave them there to serve as a decoy. 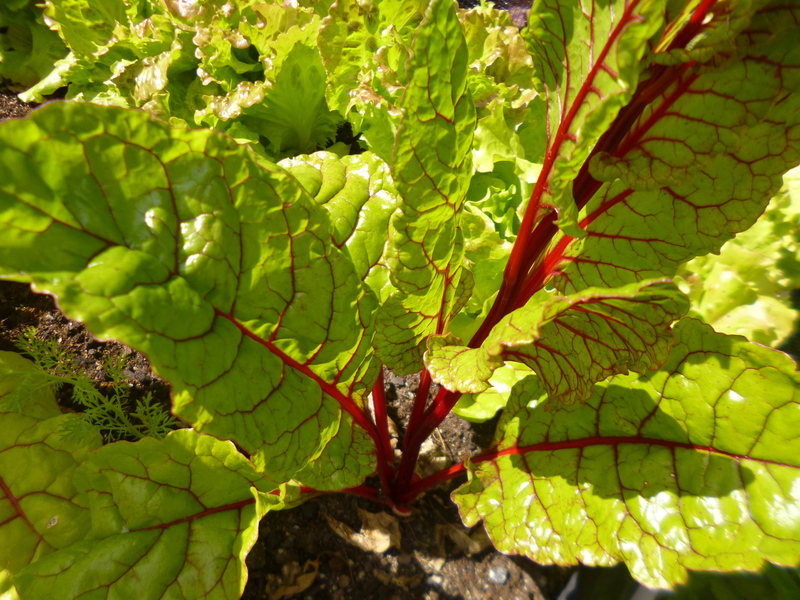 Bed B: I harvest swiss chard from some lovely looking plants. They haven’t grown too big and the leaves are luscious. Two of the plants have bolted but I decide to leave them in situ as they are about to flower and there’s something nice about their sculptural quality. The short spell of hot, dry weather earlier in July may have caused them to bolt but luckily it’s only affected two plants. I don’t harvest the kale this time around but loosen the netting a bit as the plants are growing big and healthy. There is no sign of damage from cabbage white butterflies but there is one leaf that has been chewed. I suspect something has managed to crawl underneath the netting. I root around a bit but there is no evidence of any critter lurking so there isn’t much I can do other than secure the netting down a bit more. Bed C: My most disappointing raised bed. The beans are still stunted in growth and don’t look like they’ll recover at all. When compared to the ones I’m growing at home in pots they look a sorry sight. The squash, too, are also very small compared to mine at home and some leaves are wrinkled and brown. On the plus side they are flowering a lot so perhaps they will come through eventually. The only saving grace is the lettuce and the first bright yellow Calendula flower that brings a bit of sunshine to an otherwise depressing raised bed. Overall, the lettuce in all the beds just keep growing and growing and, even after harvesting, it looks like I’ve hardly made a dent in them. Unfortunately this year they haven’t really come into their own until well into the holidays so the kids haven’t had the benefit of salad lunches yet. But I continue to harvest just to keep them from overcrowding and getting too big and bitter. Hopefully once the kids return in mid August, they’ll get to have some lettuces before I replace them with a green manure crop. Here is the some of the harvest and an overall shot of the garden in July. I could have planted more companion plants. Other than Chives for Carrots, I didn’t make as much of them compared with last year when I grew Tarragon, Hyssop and Marigolds. They also serve to fill the gaps in planting. This year, the raised beds aren’t being used to their full potential and there is too much bare earth on show. I would also make more use of intercropping, growing some fast cropping varieties in between slower growing ones, perhaps lettuce or other salad varieties. This year I will have to be content with leaving the gaps until I sow some Phacelia and Buckwheat as green manures in a few weeks to prepare the beds for winter and next year’s growing season. Talking of Phacelia (main photo), imagine my surprise to see it growing beside one of the raised beds! Phacelia is a fantastic plant to attract bees and insects, is rich in nectar and has pretty lilac-coloured flowers. But that’s not the main reason I was thrilled to see it. Last year, I had grown some seeds in one of the raised beds only to find that it had been removed one day, perhaps by someone who had mistaken it for a weed. Luckily it managed to seed itself naturally! This may also be true for the blue cornflowers that I spotted alongside some other wild flowers nearby. Last year, I sowed some cornflowers as part of an edible wildflowers seed mix. It’s great to see these wild flowers pop up unexpectedly, they add so much. Not to mention, I’m so glad there’s been a nice result from my somewhat lackadaisical approach to clearance around the raised beds!! Categories: Food growing, Raised beds | Tags: bees, cornflower, green manure, maintenance, Phacelia | Permalink.